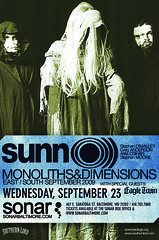 On Wednesday the 23rd of September 2009 I got off of work and met up with a friend of mine to head up to Baltimore to catch Sunn O))) at Sonar. They didn’t play the main stage, but the much smaller “club stage”, which was fine by me as it was much more up close and personal. Sunn O))) is a strange band, they rarely tour and when I heard they were coming to Baltimore, a city within driving distance, I had to get a ticket. People either love this band and think that what they are doing is really groundbreaking and genius, or they think it’s just boring ambient noise and a total waste of their time. I’m not a huge drone fan but these guys are one of the best at it, and when describing their music I often think of abstract art in music form. It’s hard to define “songs” of theirs, as it all sort of melts together and the songs don’t really have any structure, well not in the normal sense at least. Before they even took the stage they ran a fog machine on high for about 20 minutes, with a low volume recording of some sort of chants. Then at about 10:30 pm Greg Anderson and Stephen O’Malley came out on stage in their monk/jedi robes and started playing what I think was the beginning to the song Aghartha. Usually I’m pretty good at knowing what songs are being played, but again, this band doesn’t make that easy. Then about 10 minutes later Attila Csihar came up on stage, wearing a similar robe. 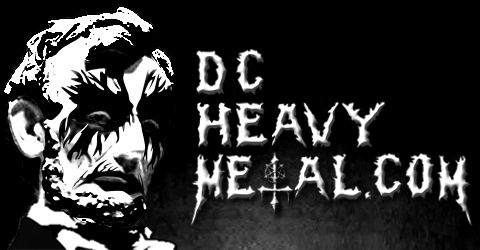 This is the same Attila of Mayhem fame, and I’d actually seen him play with them at this same venue back in May as part of Maryland Deathfest VII. His performance at this smaller show was pretty outstanding, though sometimes I got the feeling he was being a bit distracting from the music itself, it was a Sunn O))) show after all, not an Attila show. Overall it was a really excellent performance from him though and it really showcased his vocal talent quite well. I always liked him better in Mayhem than Maniac, but this Sunn O))) show really highlighted his vocal range, even if I don’t think he said one actual word the whole night. The set seemed to be what I’d basically call “songs” from their latest album, Monoliths & Dimensions, but I could be mistaken I suppose. It was an unreal experience though, like no concert I’ve been to before. At times everything seemed to be in slow motion, the music, the band’s movements, almost as if time was stretching as you fell into the event horizon of a black hole. The fog and lighting added a sort of murky element, like trying to look at something through dirty water. It was a really overwhelming experience, and it was LOUD. I mean I just saw Motörhead a few weeks before and that was loud, but these guys really made you feel every slow plodding note vibrate through every bone in your body. Of course I was a lot closer to the stage for this show, right up front. Sunn O))) doesn’t have a drummer but they did have a guy doing some sort of programming in the back, and I know I saw a trombone poking out of the fog at some point. The bass was thick and heavy like the foggy air in the room throughout the performance, and the whole thing almost seemed like it was from outer space at times. Attila added to the theatrics at about midway through the set when he put on some gloves that had laser pointers built into the fingers. The lasers really stood out in the fog and surprisingly the whole effect didn’t come off as a raver thing at all, maybe it was the oversized robe. At some point Attila wandered off the stage for a bit to put on his next costume, which I gotta say what a bit over the top. It was another robe, but this time it was covered in fragments of mirrors. It also had a head piece, something like a head band with big pointy mirror shards coming out of it, somewhat resembling the statue of liberty’s head piece. He kept the laser pointer gloves on with this and did some cool things with the lasers reflecting off the mirrors, especially off the ones on his head. It was certainly a bizarre costume, not sure I’d be caught dead in that, but then Attila has always had a thing for wearing costumes on stage. The two guitarists also had some interesting poses and lurched around on stage very slowly, giving the production a feeling of peeking in on a secret ritual of some Lovecraftian cult. The music fit this all very well and with the slow build ups and pure raw sound had the audience hypnotized. The slow singular notes building up in intensity into something almost resembling a chord progression really worked well in this setting. There were no breaks between “songs”, it was just one big musical experience. In all the show ended around midnight to an ovation from a crowd that had just had their minds melted for about 90 minutes. As I walked to the car with my friend, we caught a glimpse of the Stratovarius show, which was on the main stage that night at the club, and I remember thinking how I’m so glad I got to see Sunn O))) instead of being into that power metal crap! Damn, they had the bigger audience but those people really had no idea what they just missed only a few feet away. I’ve always been a fan of some of the more strange, bizarre and out there metal bands, of which Sunn O))) definitely fits the category of, so maybe my views on the whole thing are a bit biased, but still I highly recommend checking Sunn O))) out at least once, they definitely put on a show unlike any other band, metal or otherwise.